Scott Wagner, the Republican nominee for governor, in April. His relationship with one of his party's top fundraisers is said to be strained. Scott Wagner's ascent in Pennsylvania politics is without precedent in recent history. Shunned by his party just four years ago, he's now the Republican nominee for governor. But after an expensive and bruising primary, he may need the help of the donors who have long supported the establishment brand of politics he has attacked. In Southeastern Pennsylvania, home of centrists like the late Sen. Arlen Specter, some key GOP donors don't seem interested in helping a candidate who has identified with, and in some ways emulated, President Trump. Some donors in the area see Wagner, a former state senator and owner of a waste-hauling business in York County, as too pugnacious and too far to the right. Most notably, Wagner's relationship with Robert Asher, the prolific Republican fundraiser from Montgomery County, is strained, according to multiple GOP sources. That could hurt Wagner's fundraising, even as Gov. Wolf, a Democrat seeking a second term, has amassed $15 million. Wagner reported $1.6 million in his campaign account as of June 4, trailing by a factor of nearly 10-1. Asher controls the biggest Republican political action committee in the state — it was one of Gov. Tom Corbett's top donors in 2014 — and his support for a candidate is often seen by other donors as a seal of approval. Bob Asher, pictured here in 2008, heads an influential Republican political action committee. Of the 237 donors who have contributed to Asher's PAC since 2016, just 16 of them, or about 7 percent, have contributed to Wagner's campaign, campaign-finance records show. "If I was running as a Republican in the state of Pennsylvania, I would want Bob Asher front and center on my fundraising efforts," said Rob Gleason, a former Pennsylvania GOP chairman. "He has been raising money in the Southeast for a generation. He has all the support." Whether Asher's apparent discomfort portends actual trouble for Wagner remains to be seen. For his part, Asher told the Inquirer and Daily News: "I support the ticket from top to bottom." To be sure, Wagner might not need help from donors like Asher. Wagner largely self-funded his primary campaign and could continue to do so in the general; his campaign declined to say whether he would. And his calls to slash regulations and make Pennsylvania more business-friendly may well motivate donors in other parts of the state to invest in his candidacy. "Scott welcomes everyone on his team. If someone's serious about beating Tom Wolf then they will help us, if they aren't, they can sit on the sidelines," Wagner spokesman Andrew Romeo said in an email. "We are proud of the support we received in the Southeast during the endorsement, on primary day and since. No one person has done much to slow Scott down." Wagner supporters say it's no surprise that Wolf has more cash at the moment: the governor has the power of incumbency and didn't face a primary challenge. They say Republican donors who sat out the primary will now support their party's nominee. "I think the message is, look, it's early. We're in the dog days of summer at this point in time," said Jim Schultz, the state GOP finance chair, who predicted a "groundswell of support for" Wagner "from the donor class across the state." Schultz attended a fundraiser for the Republican Governors Association with Wagner and Vice President Pence in Philadelphia last month and said "there was energy in the room for Scott." Schultz, who left the White House last year to return to the Philadelphia law firm Cozen O'Connor, said he thought Pence and Trump would campaign for Wagner. Pence endorsed Wagner on Twitter. "I think the president's going to be in for Scott often in this election cycle. I think you're going to see a lot of the president, and the president saying good things about Scott Wagner's candidacy," Schultz said. Gov. Wolf had a nearly 10-1 cash advantage over Scott Wagner as of June 4. Wolf, a Democrat, is seeking a second term. Southeast Pennsylvania, with its concentration of people and money, has traditionally been a big source of cash for statewide campaigns. For example, of the $26 million Corbett raised for his unsuccessful reelection bid four years ago, about a quarter came from donors who listed addresses in Philadelphia or its four collar counties, campaign-finance records show. By contrast, of the $9 million Wagner has raised, slightly more than 4 percent came from Southeast Pennsylvania. Discounting money Wagner gave to his own campaign, Southeast Pennsylvania's share rises to a little over 9 percent. The comparison is imperfect: Unlike Wagner, Corbett was an incumbent. And Wagner has only been required to report fundraising through June 4 — about two weeks into the general election campaign. His share of donors from the Southeast could increase by November, and he has the support of party leaders in the region, including State Chairman Val DiGiorgio of Chester County. The area is still a draw. A day before Pence stopped by the Rittenhouse Hotel, House Speaker Paul Ryan came to the Main Line home of GOP fundraiser and insurance executive Manny Stamatakis to raise money for Pennsylvania Republican congressional members and candidates, according to GOP sources. Indeed, many Republican donors have focused more on protecting their party's majority in the House. Wagner also has to compete for dollars with Senate candidate Lou Barletta. Wagner has taken a different path to party standard-bearer than some of his predecessors who moved up through the party ranks, like Tom Ridge (a former congressman), Mike Fisher (longtime state legislator) and Corbett (former attorney general). While those gubernatorial candidates had built relationships with donors over the years, Wagner rose to power running against the establishment, winning the state's first-ever write-in campaign to the state Senate in a 2014 special election. In office, he helped oust the majority leader and vowed to carry around a baseball bat in the Capitol to make sure the legislature got things done. And while members of Congress avoided questions about Trump during the 2016 presidential campaign, Wagner boasted to reporters at the Republican National Convention that he was going to buy 20,000 yard signs. Scott Wagner shakes hands with supporters after winning the Republican gubernatorial primary in May. His approach could appeal to the GOP base that was energized by Trump, and potentially new donors as well. But it remains to be seen whether it will work for the Southeast donor class. "Scott Wagner kind of represents outside-the-establishment norms," said Matthew J. Brouillette, CEO of Commonwealth Partners Chamber of Entrepreneurs, a conservative nonprofit group. "But I'm also seeing that where he might lose some of those establishment folks, he's picking up others that think Harrisburg needs to be shaken up," he said. 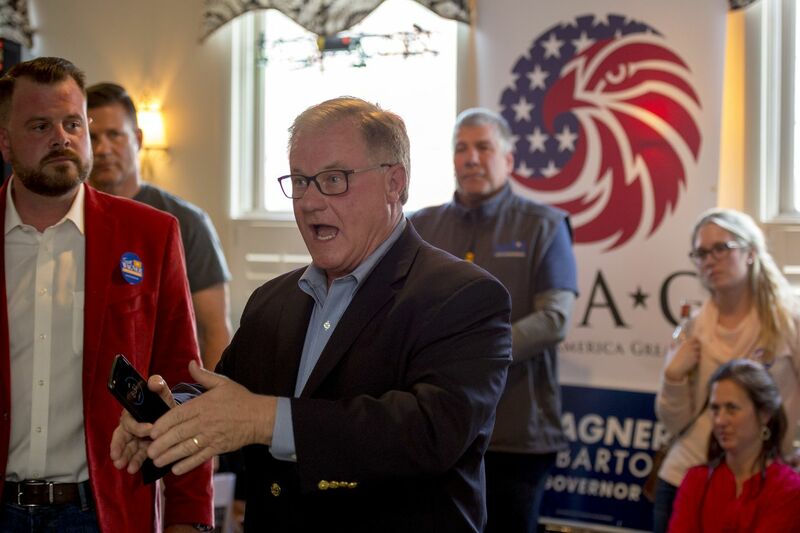 Early in the primary campaign, Wagner tapped Lower Merion real estate executive Jeff Bartos as his unofficial running mate; in Pennsylvania, the candidates for governor and lieutenant governor don't run as a ticket in party primaries. It seemed like an effort to lock up support in the Southeast; the other primary candidates were from the western part of the state. Bartos previously served on the board of Asher's political action committee, PA Future Fund. But their relationship has deteriorated, people familiar with the matter say. One possible hurdle for Wagner: Wolf held double-digit leads in the two public polls that have been conducted since the May 15 primary. Donors might be reluctant to bet on Wagner unless that gap narrows. "People want to back a winner," Gleason said. "No question about that." Wagner's campaign said the surveys were useless, arguing that they were based on voter turnout models skewed disproportionately toward Democrats. Of course, some longtime Philadelphia-area donors are planning to contribute. "I'm behind Sen. Wagner. I'm hopeful he will be our next governor," said Mario Mele, a Fort Washington insurance executive and former Montgomery County commissioner. "He's knowledgeable. He knows Harrisburg. …He's an honorable businessman, and that's what we need."